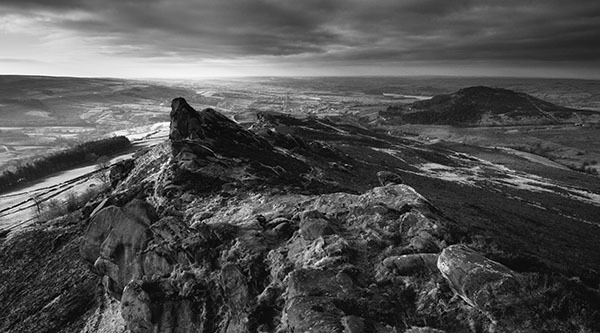 A b&w image taken from the top of Ramshaw Rocks near "The Roaches" (from the French word 'les roches' - the rocks) - a prominent gritstone escarpment situated between Leek and Buxton in the Peak District National Park. You can also see "Hen Cloud" on the right on this photo. It was an overcast morning but at the last moment a gap appeared in the clouds just as the sun popped up which was enough to give some modelling to the rocky terrain.